It's late September and the larch trees in Banff have turned a magnificent golden yellow! Their needles glow when the sun shines on them and if you haven't gotten your annual "larch hike" in yet, go now! The needles won't last long before wind and snow remove them from the trees. We always set aside at least one day near the end of September to take a hike in Banff to see the golden larches and this year was no exception. Except, we decided to do a three day backcountry trip instead and go in search of "hidden" larch trees a little more off the beaten path. It was a total success and we only met one other couple the entire time we were hiking in our magical meadow high above Shadow Lake. We started our incredible hike to Gibbon Pass last Saturday from our backcountry home for the weekend at Shadow Lake Lodge. We'd hiked in to the lodge Friday on the Red Earth Creek Trail, and planned to hike out again on Sunday. This left us all of Saturday to explore the meadows above the lodge. We knew it would be a bit of a climb to reach Gibbon Pass with 500 metres of height gain from our lodge spread out over about 3km. Noah surprised us through and was a strong little hiker the whole time. He ran up the switch-backed trail and it took us less than 2 hours to reach the pass. Deciding to go Climb A Mountain! From Gibbon Pass, we looked up at the closest summit on Copper Mountain and thought, what would it look like if we could just get above the trees? We won't actually climb the whole thing, but we can at least go up another 100 metres to get a better view, right? Looking down on the trees above the pass from lower slopes on Copper Mt. Looking back at the pass was pretty. But we were so close to the ridge on Copper Mt. We could make it that far, right? Just to the ridge? Looking WAY down to Gibbon Pass! The view above is why we decided to climb to the ridge above Gibbon Pass. It was spectacular and we only had to climb another 100 metres from the pass. I highly encourage everybody visiting Gibbon Pass to at least climb up to the ridge on Copper Mountain to get this view. And, then you can do some ridge yoga too! The summit was so close!! Now, this isn't the real summit of Copper Mountain, but it's the closest summit on Copper that you can easily tag from Gibbon Pass and it was good enough for us! And we honestly think Noah is probably the youngest child to have ever climbed up here. I wish every day looked like this! It seriously only took us an hour maybe to tag the summit from Gibbon Pass. It was a total of 700 metres up from the lodge to the summit and maybe 8 km round trip. If a 5-year old could do this, any lodge guest at Shadow Lake could easily do it as their day trip between breakfast and afternoon tea! Dad and son just below the summit of Copper Mt. We had lunch just below the summit, took a lot of photos, and then started running our way down. 5 year olds I have discovered, have no other pace when descending a mountain than flat out running! Lunch below the summit of Copper Mt. That be me - and my 5 year old son!! Wahoo! Running Down - weeeeee...... It was fun and it did not take long at all! Noah was starting to get tired by this point, but it was all downhill and it really didn't take long to get back to the lodge. All in, it took us about 5 hours to do the complete trip door to door. We got back at 3pm just in time for afternoon snacks and tea time! That's the summit I just climbed! Want to Hike to Gibbon Pass? Gibbon Pass is located on the Bow Valley Highline Trail which starts at Sunshine Village and traverses high through the backcountry of Banff past Egypt Lake and on to Shadow Lake. It crosses over Gibbon Pass and finishes at Twin Lakes where you descend back to the highway near the border with Kootenay National Park. 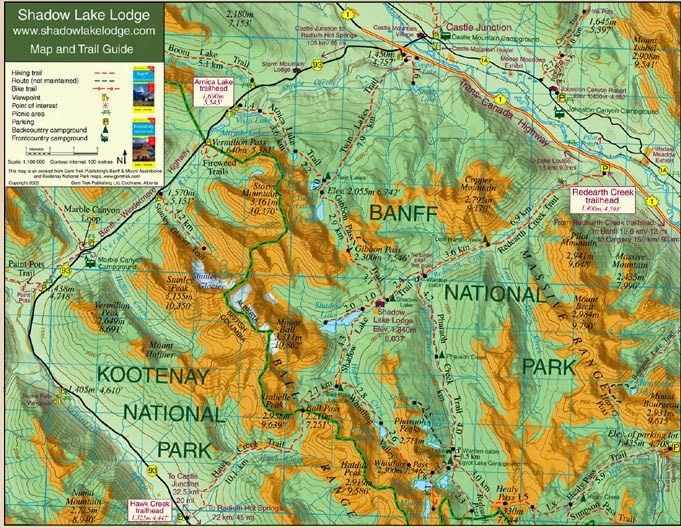 I've attached a small map below but you can see and print the full map from the Shadow Lake Lodge website. We chose to access this amazing area via the Red Earth Creek trail because it was the shortest and easiest way to get to Shadow Lake where we were staying. If you wanted to do a bigger backpacking trip, you could start at Sunshine Village and hike to Egypt Lake (day one,) camp at Shadow Lake on day two (or stay at the lodge,) and then hike out via Gibbon Pass and Twin Lakes on day three. Some day we are going to complete the whole journey as a family but for now, we are happy to have completed the middle portion of the traverse. Want to Climb Copper Mountain? It was a very simple scramble and if you're at Gibbon Pass, it's easy to find the route. Just head through the trees towards the bald bump that you see above the pass. We found a very well maintained trail through the trees that took us to tree line. From there, we followed a trail in the scree that took us to the ridge. Once at the ridge, just follow it to the top. The summit is 200m above the pass at most. Want to Live it Up in Backcountry Decadence for a Weekend? For more information on staying at Shadow Lake Lodge, please visit their website at the previous link. The lodge closes after this coming weekend for the fall and then will reopen for winter skiing! I've been to the lodge many years ago in winter and it's a fabulous ski destination! The lodge is very easy to access on cross country skis and the scenery is stunning out that way in winter. I'll be writing more about the lodge in upcoming weeks and I'll also be writing about some creative ways to reach the lodge with small children. Beautiful pictures, looked like a lot of fun! I want to go there soon! Thanks. I highly recommend the trip!